Learn About the Environment and How We Can Preserve It. We have a bike shop to get you moving, the cafe to get you going and the wholefood shop to keep you going. The Warehouse exists to promote, educate and inspire sustainability and positive environmental change. Providing meeting, office, retail and public display space to the local community and organisations that believe in what we do. 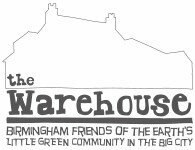 Create a carbon neutral and zero waste building that is accessible to everybody in Birmingham. Keep up to date with the latest competitions, discount and news by signing up to our monthly newsletter.